Four Capital-area accounting firms are among the nation’s top 100 firms in terms of revenue. 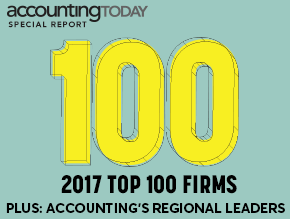 The 2017 edition of Accounting Today’s annual list of the top 100 firms in the country includes Kearney & Co., of Alexandria, Va., at No. 31; Aronson of Rockville, Md., at No. 75, Raffa of Washington, D.C., at No. 82; and SC&H Group of Sparks, Md., at No, 83. Kearney & Co., Alexandria, Va.
PB Mares, Newport News, Va.
Arnett Carbis Toothman, Carleston, W. Va.
Brown, Edwards & Co., Roanoke, Va.
Cotton & Co., Alexandria, Va.
Calibre CPA Group, Bethesda, Md. Hertzbach & Co., Owings Mills, Md. Gelman, Rosenberg & Freedman, Bethesda, Md. Young, Hyde & Barbour, Winchester, Va.
Smith Elliott Kearns & Co., Hagerstown, Md. There is very little change at the top of Accounting Today’s list. The names of the top 25 firms haven’t changed since last year, though the rankings are slightly different. And what issues are keeping these issues up at night? That should come as no surprise to anyone who is trying to run a CPA firm. Talent tops the list, but business growth and development also is keeping leaders of top firms up at night. With more firms feeling the pressure to grow, industry consolidation through mergers and acquisitions will undoubtedly continue in the near future. Innovation: “It is the lifeblood of a CPA firm’s culture that is committed to growth,” says Mark Stebbins, vice chair and tax practice leader at Freed Maxick in Buffalo, N.Y. Adds Andy Armanino, managing partner of Armanino in San Ramon, Calif.: “Innovation is in many ways tied to growth. If a firm remains stagnant and isn’t looking for ways to innovate, it will quickly lose market share. Developing specialties / competitive advantages, particularly in areas like HR consulting, risk advisory services, cybersecurity and client accounting services. Read the complete Accounting Today report here.